Tak Sakaguchi burst onto the scene in 2000, starring in the adrenaline-fuelled, blood-soaked, zombie action movie Versus, which became something of a cult favourite among Asian cinema aficionados. It may have been the sheer energy of the direction that got most converts talking about the film, but Tak Sakaguchi helped it work by exuding an effortless cool in his badass leading role and showing an impressive physical dexterity in the numerous fight scenes. He cropped up in several similarly bonkers and cult-chasing titles following this, such as Azumi (also from Versus director Ryûhei Kitamura), Tokyo Gore Police, Yakuza Weapon (which Tak directed himself) and more recently Sion Sono’s Why Don’t You Play in Hell?. 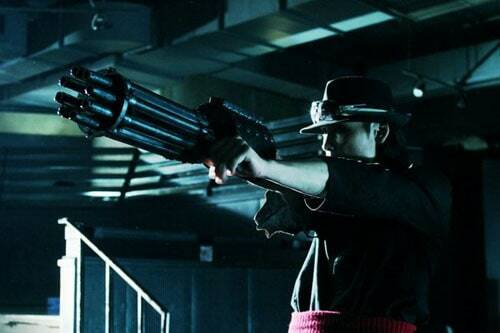 It’s been a while since he’s taken a notable lead role though, so I was glad to see his name crop up at the top of a press release for Re:Born, which sees him turn his hat to a straight-up martial-arts/action movie that reportedly boasts “a signature style you will not have witnessed before”. Now I’ve seen a lot of martial arts movies in my time, so that’s quite a claim to make stick. I fell for the bait though and gave the disc a spin. 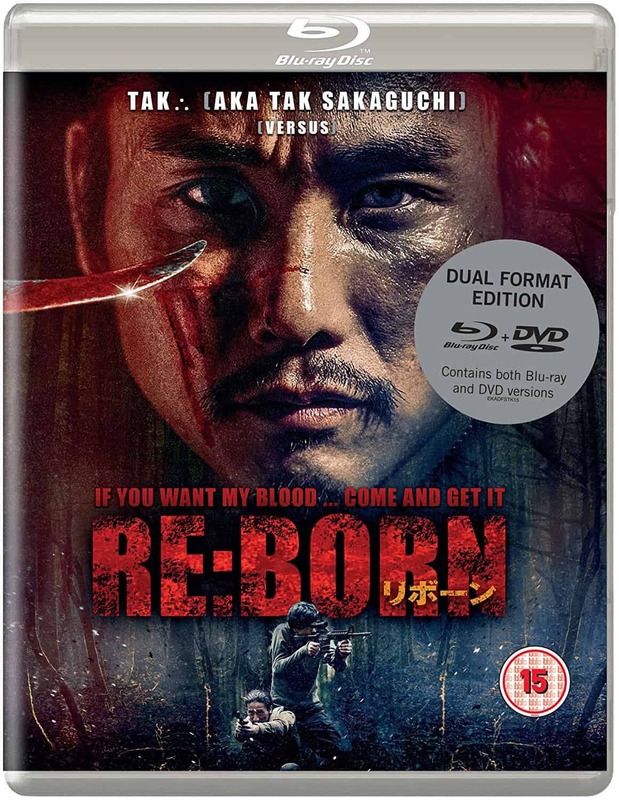 Re:Born sees Tak (he’s now dropped the Sakaguchi moniker and replaced it with a symbol that looks like the Predator’s laser sight) play Toshiro, a former special forces operative who now works in a convenience store and lives with his young niece Sachi (Yura Kondo). His peaceful existence comes under threat however when his past comes back to haunt him. You see, the team he used to work for was engaged in practises he couldn’t support, so he walked out. Like leaving the Mafia though, it’s not as simple as that and Toshiro’s former boss, dubbed Phantom (Akio Ôtsuka), wants him dead. Killing the man who was the best in his team is not an easy task though, so he sends his entire troop of elite killers to take him out, including the cold-blooded Abyss Walker (played by the film’s fight co-ordinator Yoshitaka Inagawa). As you might expect, mid-way through the film Sachi gets kidnapped too, so Toshiro decides to face Phantom once more and end it all properly. This is quite far removed from the films I’ve previously seen Tak feature in. Whereas most of the titles I mentioned previously were anything-goes affairs that fused multiple genres, Re:Born is stripped back and simple. The setup is an action movie cliche in itself and the half-way point kidnapping is as textbook as they come. The film doesn’t dwell on the plot too much, instead using it as a familiar frame to hang a huge number of action scenes. That said, the first half keeps these fairly short and sharp, so there are a few weak, uninspiring moments when the story is dolled out. In the second half the film really fires up though. The entire final 45 minutes or so are made up of Toshiro and his two teammates taking on Phantom’s army and saving Sachi. The action scenes here are very impressive too. Whereas the action in the first half largely consists of quick take-downs of low level goons, the scenes are extended further as the film moves on, building nicely to a brutal face-off between Toshiro and Abyss. Also worth a mention is an inventive tussle in a cramped phone booth. The action is fast, fluid and knife-heavy (or any spiky object at Toshiro’s disposal). It’s not a mind-blowingly new style in my eyes, but makes impressive use of opponents’ own movements and weaponry against them. It also involves getting into a fluidly writhing, snake-like stance, which is cool for the most part, but looks a little silly now and again. Toshiro’s superhuman ability to dodge bullets can be hard to swallow too, although it makes for a supremely badass hero to root for. Director Yûji Shimomura, who has worked more frequently as a stunt/action co-ordinator/choreographer does a great job of handling the action scenes. They’re fast-paced without looking messy and effectively feature a lot of slow-motion in appropriate moments. His handling of the more dramatic scenes isn’t quite as impressive though and away from the action the film can look and feel a little cheap and err on the side of melodrama. These weaker scenes feature most heavily in the first half though, so, as I alluded to earlier, it’s a case of starting off average then building to something rather special by the end. Lazily plotted and full of cliches it may be, but if it’s action you’re looking for, you’ve come to the right place. 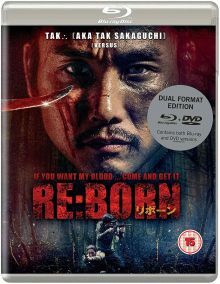 Re:Born is out on 15th March on dual format Blu-Ray & DVD in the UK, released by Eureka. Picture and audio quality are solid, but the only notable special feature is an incredibly short introduction by three of the filmmakers which is largely just a brief and not particularly impressive martial arts demonstration.